EarthLust water bottles are so sleek and awesome, I couldn't help but coordinate to give one away. Like I mentioned below, the stainless steel bottles come in 1 L, 20 oz. and 13 oz. sizes and are BPA-, phthalates- and PVC-free so they won't leak any toxins into your beverage. Plus, new nature-inspired artwork and designs are constantly rolling in to keep the collection fresh. They also have their Birds & Bees line so the little tykes can share in on the eco-friendly movement. This week one of you will win a 20 oz. 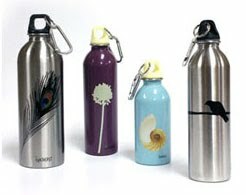 stainless steel bottle in the design of your choice (except for Swallow). Personally, I've got my eye on Cow Parsley, but browse through their selection and comment on which one you'd love to own. A random winner will be announce on Friday! 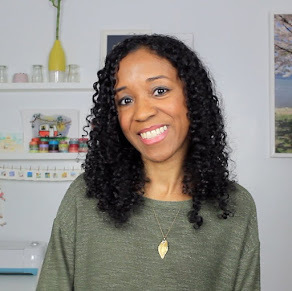 CONGRATULATIONS: Janet is this week's winner! Those are beautiful - I especially like the 20 oz. poppy one. Gorgeous! I find that I prefer water bottles like these. They're much more convenient to have than having to buy a bottle of water all the time. I was just talking about how we need to stop using plasic! I love the 20 oz. silver crow or poppies! They are so cute! I love all of them lotus is gorgeous but if I had to choose def Peacock! I hate to sound unoriginal, but I like the poppy one best too! I've always wanted [read as: needed!] one of deez bottles! SIGN ME UP, PWEEEEZE! I hope you pick me! I am with you, Cow Parsley please. love love love the peacock! They exceptionally nice - who'd of thunk they would make art out of a water bottle? Of course, I think there is a lot of beauty in plain/pure stainless steel (and chrome). I'll watch this time around to see who wins! It's tough to choose but I really love the peacock with the lotus as a very close second. HOw cute! I like peacock, poppy, and purple flower. Wow! Beautiful bottles. I think my favorite is Gingko! How to pick just one? I'd have to choose between Lotus, Poppy or Purple Flower. i love the cow parsley bottle! or the cranes! wow. they're all really cute. !! Omg shaun is such an idiot! I asked that punk his opinion and he was secretly shopping for one for himself!